The use of uncut diamond as fine jewels has made its first comeback since ancient times. The diamond industry in just the last few years has perfected the cut in diamond; nature figured this out a long time ago. Owning a natural diamond crystal is owning a true jewel. A cut diamond is a commodity with a billion examples. The diamond cutting industry utilizes almost 100% of the supply. 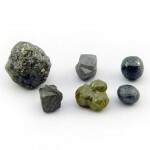 As a result gem cuttable rough stones are exceedingly rare and can command prices that exceed cut value. 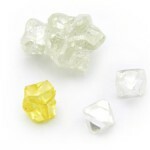 Non gem, near gem and industrial diamond crystals are affordable and can be very attractive. Placer Gold Design has on occasion had first pick of extensive inventories and has secured fine examples. Diamond crystals are carefully selected for use in fine jewellery with the occasional rare form for the specialized collector. Mined from the Ekati Mine in the Northwest Territories in Canada, these diamond crystal tops have been selected for the finest color and crystal form. The crystal tops are approximately 30% of the original crystal weight. They are in their raw, natural state with the exception of the single saw-cut. The crystals come in sizes of 0.03ct up to 1.0ct. The Argyle Diamond mine is in the East Kimberley region of Australia. This mine is the largest producer of pink diamonds in the world. Many of the natural fancy colored champagne and cognac diamonds come from this locale. 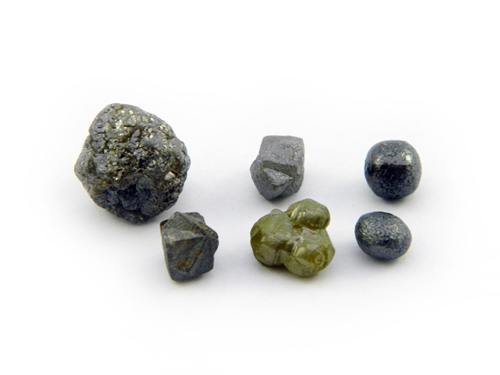 Placer Gold Design offers a stunning collection of facinating raw crystals from this mine in many colors. Choose from cognac colored crystal tops to yellow mackels. The Democratic Republic of Congo is a member of the kimberley process, exporting approximately 8% of the world’s diamonds. 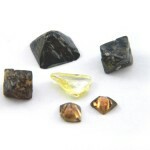 Placer Gold Design offers fascinating selection of whole raw diamond crystals from this region. 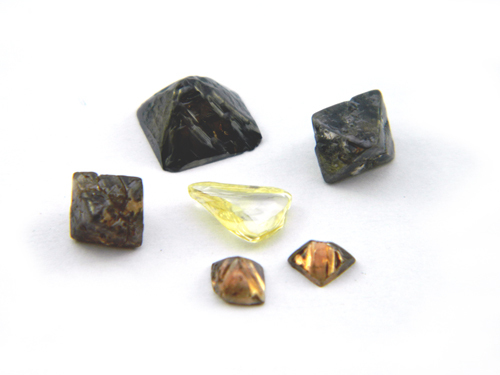 All of Placer Gold Design’s diamonds are conflict free. The world’s largest open cast diamond mine is the Mirny Mine located in Mirny, Siberia. The open cast mine is currently closed, however an underground diamond mine in the area still produces many beautiful diamond specimens. 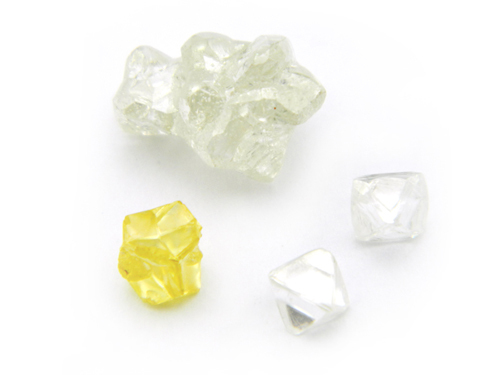 Placer Gold Design’s raw diamonds from Russia are some of the most flawless on the market today.